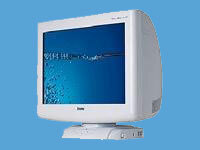 LCD monitors are fast becoming commodity items. As prices drop, 17-inch flat panels become the new 15-inch, with 19-inch screens the new 17s. However, you can still find products that differentiate themselves with innovative features and superior performance -- at least according to LG Electronics. 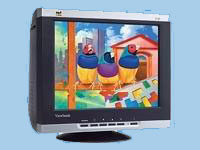 The company's Flatron L1980Q fits is an elegant-looking, 19-inch-diagonal LCD with interesting new features -- notably a super-flexible stand that's the best for giving presentations we've seen -- and fast response time -- rated at 8 milliseconds, blowing 16ms and 25ms panels away for users who want absolutely no ghosting or streaking with fast-moving games or video. We confirmed the streak-free claim by watching a DVD movie. But would-be showoffs should note that the L1980Q's performance comes at a premium price -- list $795, which even after the usual discounting (to $600 at Best Buy, for example) puts it at the top of the 19-inch LCD segment. That includes a wall-mounting bracket, however, which many rivals omit. The LG's other specifications are middle-of-the-road rather than best-of-breed: Its pixel pitch is average at 0.294mm, but it's not hard to find flat screens that best its rated contrast ratio of 500:1 and 250 nits of brightness. Resolution is the usual 1,280 by 1,024 pixels, at either the usual 60Hz or a higher refresh rate of 75Hz; to our eyes, the latter helped deliver a crisp, rock-solid image if not a particularly bright one (perhaps a factor for gamers seeking enemies lurking in shadow). 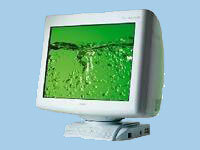 Both analog VGA and digital DVI-D interfaces are built in. 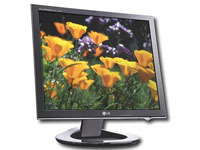 LG boasts that the Flatron's proprietary f-Engine image-processing chip is unique in its ability to enhance brightness without adversely affecting color and vice versa. Unfortunately, this is extremely subjective territory; we thought the L1980Q looked good, but not that much better than the 19-inch Dell 1905FP display we happened to have on hand. The LG's proudest physical characteristic is the way it bends over backward for easy viewing -- literally. While most flat panels tilt 10 or 20 degrees on their bases to help you find the best angle, the L1980Q tilts back over 150 degrees, making the screen visible by someone sitting or standing on the opposite side of your desk. To be sure, some users may never need this feature, but if you want to show a customer a Web-based demonstration or her account information, or want to save your boss the trouble of getting up and walking around the desk to check your work in progress, it's neat. Obviously the backflip wouldn't be terribly useful if the screen image stayed upside down, but LG provides ForteManager software that automatically inverts the image when you tilt the screen back for the viewer on the far side of the desk. The feature could also be useful if you have a few people standing around a conference-room table: Push the screen back so it's more or less horizontal or parallel to the table surface, and several onlookers can see a presentation, engineering drawing, or spreadsheet. The software's automatic pivot feature also works when you rotate the display from standard landscape to portrait mode, which is handy when you're editing a word processing or desktop publishing document and reduces up-and-down scrolling when perusing a Web page. One more plus for customer presentations is the L1980Q's elegantly svelte appearance: LG claims that the display and its 17-inch L1780Q sibling are the thinnest LCD monitors available, just about 0.8 inch thick at the edge. Most of the back is flat, except for a circular protuberance in the middle. By way of comparison, our Dell 1905FP is well over two inches thick, narrowing to about 1.5 inches at the very edge. The one thing we don't like about the LG's physical form is the integrated desktop stand or vertical arm on which the monitor sits. It tilts, providing much of the monitor's flexibility, but it's too short: With the arm at its highest angle, the bottom edge of the monitor is only about two inches off your desk. To get anything close to an optimal ergonomic configuration, you'll need to tilt the screen well back, and you're still left bending your neck to look down instead of straight ahead at the display. 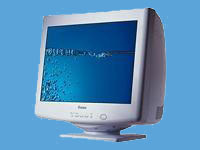 The monitor is fairly easy to set up and use. The ForteManager software includes a Windows interface that lets you adjust settings such as brightness, contrast, and color temperature. This is a good thing because the hardware controls -- touch-sensitive nubbins on the bottom rear surface of the monitor -- are neither conveniently placed nor user-friendly. The documentation, in poorly translated English, is barely acceptable. One online PDF document with instructions on how to install the software drivers has duplicate pages and requires you to hit the Previous button to get to the Next page, and some instructions at the end were missing entirely. Overall, we were impressed with the monitor, albeit more for its flexibility than its price/performance. But if your 19-inch LCD shopping list has a higher-than-usual number of checklist items -- portrait/landscape pivoting, fast refresh, customer presentations -- the L1980Q is a better-than-average pick.